As evidenced by SourceForge and GitHub, code repositories now integrate Web 2.0 functionality that enables global participation with minimal barriers-to-entry. To prevent detrimental contributions enabled by crowdsourcing, reputation is one proposed solution. Fortunately this is an issue that has been addressed in analogous version control systems such as the *wiki* for natural language content. The WikiTrust algorithm ("content-driven reputation"), while developed and evaluated in wiki environments operates under a possibly shared collaborative assumption: actions that "survive" subsequent edits are reflective of good authorship. 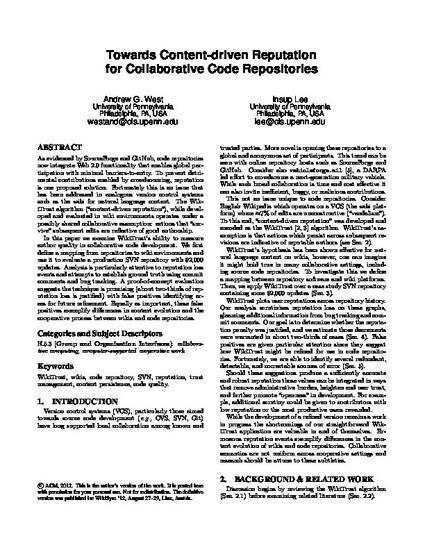 In this paper we examine WikiTrust's ability to measure author quality in collaborative code development. We first define a mapping from repositories to wiki environments and use it to evaluate a production SVN repository with 92,000 updates. Analysis is particularly attentive to reputation loss events and attempts to establish ground truth using commit comments and bug tracking. A proof-of-concept evaluation suggests the technique is promising (about two-thirds of reputation loss is justified) with false positives identifying areas for future refinement. Equally as important, these false positives exemplify differences in content evolution and the cooperative process between wikis and code repositories.